I have yet to gain access to or familiarize myself with the newly-drafted Public Universities Bill, so I shall not waste anytime vacuously and pontifically commenting on the same in the downright puerile manner and tacky turn taken by Mr. Samuel Okudzeto-Ablakwa, the former Deputy Minister of Education for Tertiary Affairs (See “University [sic] Bill: Don’t Be Idi Amin – Ablakwa to Akufo-Addo” Classfmonline.com / Ghanaweb.com 4/11/19). The question now becomes: But why would the National Democratic Congress’ Member of Parliament for North-Tongu drag in the name of late-former Ugandan dictator Mr. Idi Amin Dada into the fray? I mean, it is not exactly as if the globally infamous Founding-Father of the National Democratic Congress (NDC), Mr. Ablakwa’s own political party, former President Jerry John Rawlings, had dealt any far more democratically with our major institutions of higher learning during the 20-odd years that Chairman Rawlings ruled the proverbial roost as a “Maximum Leader” or an Absolute Monarch, with legal and statutory powers that far exceeded those of any European Imperial Monarch in Ghana’s 62 years of postcolonial political culture. You see, only Ghanaian politicians who were born in the 1980s, about the time that I departed the country for the United States, during the fast-rising tide of the Rawlings-Tsikata Diarchy, and about the same period that the Tongu-North’s NDC-MP had been born, have the pernicious luxury of blissful ignorance to make the kind of scandalous statement that Mr. Ablakwa recently made in the wake of his apparently desultory reading of the Public Universities Draft-Bill that, as of this writing, has yet to be fully debated and duly revised and/or amended, where deemed to be relevant and/or appropriate, by the full-membership or plenary session of Parliament. Indeed, were the Tongu-North’s MP a critical thinker worthy of note, Mr. Ablakwa would have since produced a more democratically conducive and viable alternative to the Draft-Bill in question, rather than unwisely grandstanding on the same almost as if he had any enviable track-record, both as an individual politician and a key operative of the main opposition National Democratic Congress. His very execrably primitive public excoriation of the Public Universities Draft-Bill informs the Ghanaian public more about the reprobate and cynical character of the critic than the evidently tentative contents of the Bill itself. You see, we are dealing with a man who, as a Deputy Education Minister, summarily withdrew, with the unreserved and very public support and approval of then-President John Dramani Mahama, the age-old Research Allowances for our public university professors and lecturers. 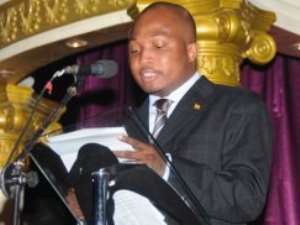 Instead, Messrs. Ablakwa and his bosses, including the then substantive Education Minister, Prof. Jane Naana Opoku-Agyeman, wanted the government of the Mahama-led National Democratic Congress to consolidate these allowances into a Common Fund to be managed and capriciously disbursed by a government-appointed administrator, according to whom the aforesaid appointee deemed to be either deserving or professionally qualified for the same. In other words, such fund was not going to administered or disbursed by any of the functionally relevant departments of the various public universities traditionally charged or delegated with effecting the same. Does this sound like the meticulous promotion of the sort of “Academic Freedom” that Mr. Ablakwa is so self-righteously pontificating about? Indeed, it may very well be instructive and for his own direly needed intellectual and professional enlightenment for Mr. Ablakwa to compare the democratic achievements and credentials of President Addo Dankwa Akufo-Addo with the collective achievements of all three Fourth-Republican National Democratic Congress’ leaders and draw a balance sheet for the appreciation of all progressive-minded Ghanaian citizens. You see, anybody facilely tempted to concur with the cheap and tawdry anti-Akufo-Addo screed by the North-Tongu NDC-MP just needs to recall the name of the architect and undisputed author of the landmark Repeal of the Criminal Libel Law, the seminal legal instrument that today makes criminal scofflaws and unscrupulous political scam-artists like Mr. Ablakwa take obscene and heretical potshots at Nana Akufo-Addo, without pondering the hitherto punitive implications of the same for even a split-second. Which is why one cannot but unreservedly agree with Vice-President Mahamudu Bawumia’s all-too-righteous call for every progressive-minded Ghanaian citizen, in particular supporters and sympathizers of the ruling New Patriotic Party, to constantly recount and heartily celebrate the enormous achievements of the Akufo-Addo-led government of the New Patriotic Party.